Corporates less convinced about a big dollar decline? We may be a little premature in discussing this topic, but in speaking to some customers we are getting a sense that high US dollar hedge ratios are being reconsidered. In other words, corporates are possibly becoming less convinced about a further large dollar decline and, where hedging mandates allow, over coming months could be scaling back some of their more aggressive USD hedging. While most corporate FX hedging decisions do sit within clear mandates, there is typically a little room for discretion. For example, when EUR/USD was below 1.10 in late 2016 and early 2017, larger European corporates typically held the view that the USD was overvalued (most fair value readings were in the 1.25 area) and that hedge ratios on expected USD receivables should be higher, e.g. closer to the top end of the 50-100% range and should cover longer tenors. Here, treasurers made special requests from the board to extend the horizon for USD hedging. 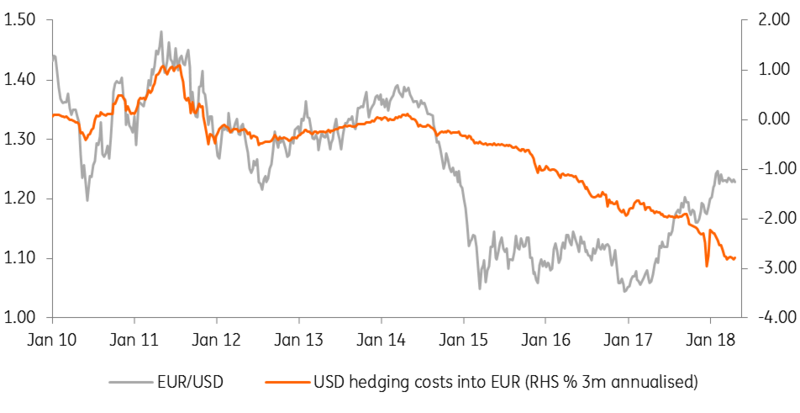 With EUR/USD a lot closer to fair value and now USD hedging costs near 3%, we get a sense that corporates may be starting to reconsider whether they roll those aggressive USD hedges – or perhaps cut those USD hedge ratios a little. Even a rolling three-month USD hedge into EUR costs close to 3.00% annualised - questioning whether corporate treasuries are right to be paying away 3% of their hard-won USD receivables. We doubt that there is a magic number – e.g. 3% - where USD hedging costs become prohibitively expensive. But we would say that the EUR/USD bull story does need feeding – be it Trump’s protectionist policies which embody a need for a weaker dollar or some fresh news from the ECB that the end of QE is on track and that the 1Q18 slowdown has not altered the ECB outlook. 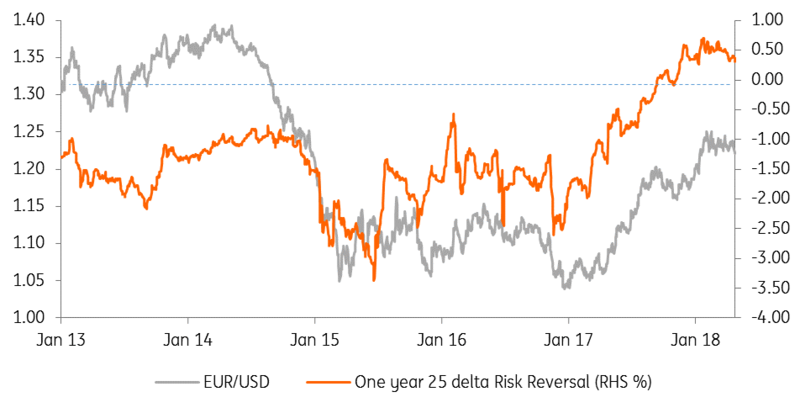 We also think it’s worth watching the 12-month EUR/USD risk reversal in the FX option market. This reflects the cost (in %) market players are prepared to pay for a EUR call option over an equivalent put option. Corporates typically dominate this segment of the FX options market. As the chart above shows, the cost of a EUR call relative to a EUR put has been rising significantly since last summer. Recent stability in this risk reversal has gone hand-in-hand with EUR/USD consolidation in the spot FX market. But any decline in this risk reversal – perhaps below 0% - could be a sign that corporates were indeed reassessing their medium-term USD outlook. As for our views – we’re convinced EUR/USD will be a lot higher over the next two to three years on the back of: a) US twin deficits and a late cycle economy and b) portfolio flows returning to the Eurozone as the ECB winds down its QE programme. We think any move below 1.20 will be relatively short-lived this quarter and retain a 1.30 year-end forecast.